This lesson you will learn new words related to relationship. My brother’s girlfriend is sulking, and he wants to find a way to make it up to her. Now, Kookai is sulking a lot. She refuses to answer my call. She found out that I had a secret lover. If I were Kookai, I would break up with you long time ago. If I were you, I woud make it up to her. Take her to have a fancy dinner at a nice restaurant. ngâai jà dtaai ง่ายจะตาย It is very easy! Right now, I am broke. ngawn (งอน) = to sulk / the feeling that you are not pleased about what you are treated. I hope you find this lesson useful, and learn something new. Feel free to leave any questions or comments below. VIDEO: Most Popular Thai Slang of the Year! this lesson helps me so much!!!! thank you teacher mod so much !! can you speak vietnamese teacher?? HI Mod, i have been trying to read the Thai text above and cannot understand why the consonant (ค์) is in the sentence? Please help! It is the way the word is spelled. In Thai language there are many words that come from other languages such as Pali, Sanskrit, English etc. Those words are spelled in accordance with the original word and therefore when it is written in Thai it has a silent letter. Thank you for this video. You teach us many words, however, the best is your explanation. You’re a natural. “chan” is the personal pronoun ‘I’. The other word is actually “mai…leoi” meaning ‘not at all’, leoi at the end is used for the emphasis. kao mai yawm rap toe-ra-sap chan leoi = she doesn’t want to asnwer my call at all. Korp kun mahk na krup. I have 2 question to this lesson. First it contacts this comment, โทรศัพท์ชั้น is express the possesion, that ” my call”, so theres no need for โทรศัพท์+ของ+ชั้น ? Second its when you use first ถ้า, the second sentence theres no ก็จะ after the subject. In which cases shouldnt we use? First answer, In spoken Thai the word ของ is often dropped. Second one, Again this is spoken language. 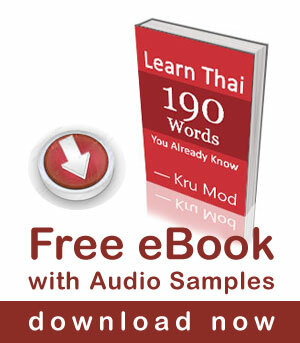 You will notice that in spoken Thai many words are dropped. We don’t say everything as in written Thai. ก็จะ is often dropped in casual conversation. Thanks Mod. This lesson is useful. I enjoy to learn Thai with you so much. Thank you! Thanks Mod. I enjoyed this lesson. As you said it is more difficult because of the new vocab with a lot of idiomatic expressions. Also some unusual pronouns and the more complicated use of the structures “iff … Then” and “Leow ….la”. Thank you. What place you like in Bkk Mod to make dinner rûu rûu?? Did you get that transcription right? Mod khoun pen phét souuay thiisoùt khoong thawiip aasiaa!!! Thank you so much. It is very useful and easy to understand. Great to have more complex sentences, discussion and idiom like this!!! Thats a great video and for me something i can learn from as i`ve been studying Thai for about 5 years now and i`m way past most of the stuff you teach but this video is right at my level i found it interesting and i it taught me 2 new words `jàp dâai` & `ngawn` so thank you very much !! Why not change Dor Dek to `t`…. Kru Mod…Thanks for another great lesson. You’re so generous with your time; sharing such great knowledge with us. Your lessons are always so useful and relevant. Great selection of words in this one and I like how it’s starting to get to a level where theres compound sentences with separate clauses. Really helpful when trying to learn to speak fluently…well, somewhat fluently. Thanks so much. Very good Mod. This is just the level of language which I need. More please.